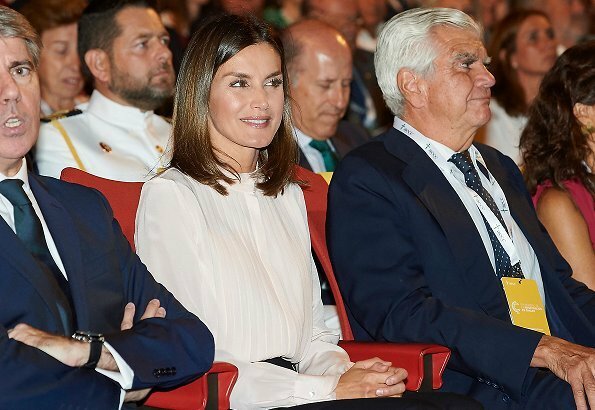 On September 24, 2018, Queen Letizia of Spain, who is Honorary President of the Spanish Association Against Cancer (AECC) and its Scientific Foundation, presided over the delivery of Aid for Cancer Research grants and the award "V de Vida" 2018. 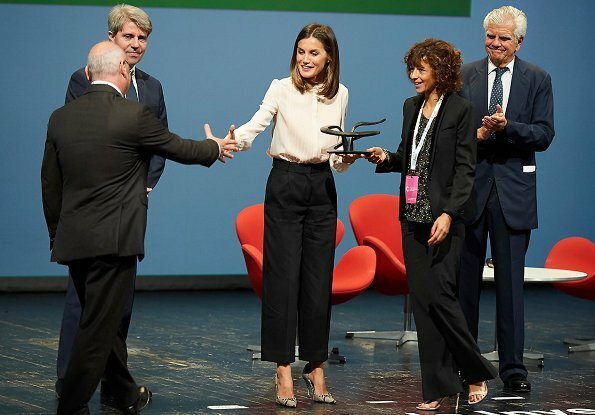 The award ceremony was held at Canal Theater in Madrid. 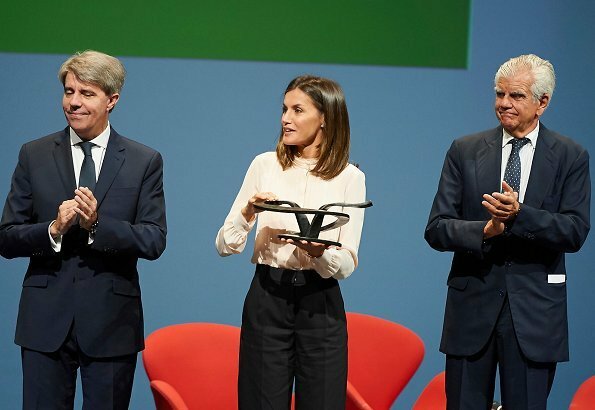 This prize is awarded annually by the AECC to people and organizations that have distinguished themselves through their collaboration in the fight against cancer An awarded career. This outfit is ok, not one of her best, but not the worst either. At least the shoes add some interest. These trousers are too short, giving her a strange silhouette on stage. The outfit is boring otherwise, and would be suitable more maybe suitable for teacher or librarian. 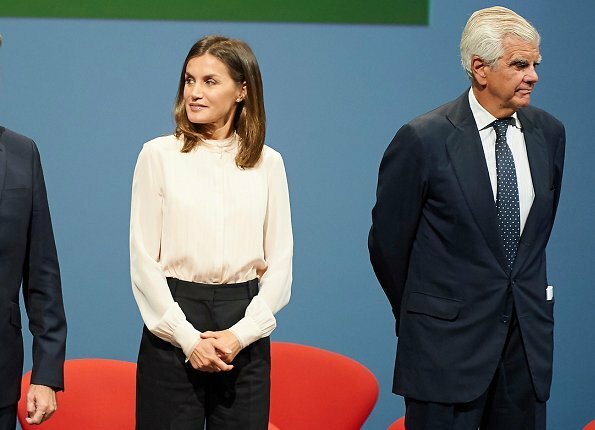 Letizia rarely misses but I think she has done so here. Because both teachers and librarians wear boring clothes? I am a teacher and would not wear this. Many teachers are quite stylish, be careful about stereotypes! I am too and would not wear this. The fashion for short/ cropped/ three quarter length trousers cannot end soon enough, In my opinion. Overall love Q Letizias look today. The pants should have been a bit longer. Love the shoes. It's fine - it's smart and "appropriate" (hate that word) but nothing exciting. En este acto no hay espectáculo. 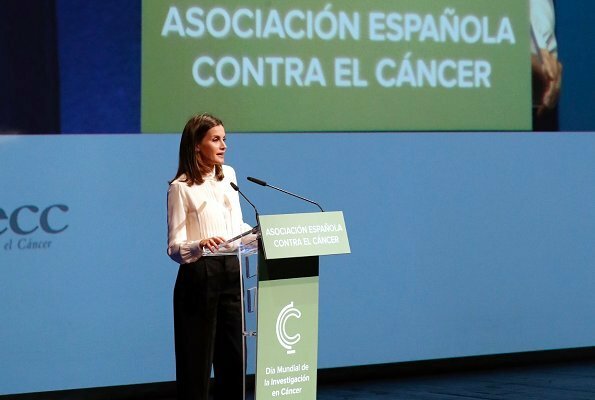 Los protagonistas son las personas que trabajan sin descanso para acabar con el cáncer. La Reina les rinde homenaje vistiéndose de forma sencilla, seria, correcta y profesional. Perfecta. De acuerdo contigo, como siempre. This trousers' length is quite trendy. It is ok.
Trousers would be better with a belt. At least she has a different look for this event. So she is not boring . Like this outfit, she is looking very feminine (as always). Those trousers don’t work with the spiky heels. They are trendy and look elegant with a different shoe. Not a fortunate bunching of trends. Doesn’t work for me. All I can see is truly bizarre silhouette (makes her look like she has weirdly curved legs (which I know she doesn’t). Her pants are NOT too short. That is how they are supposed to be. She has others this length. I have always loved these shoes, and they are perfect with the pants. A lower heel would dress down the outfit. If anything, I am not such a fan of her blouse. 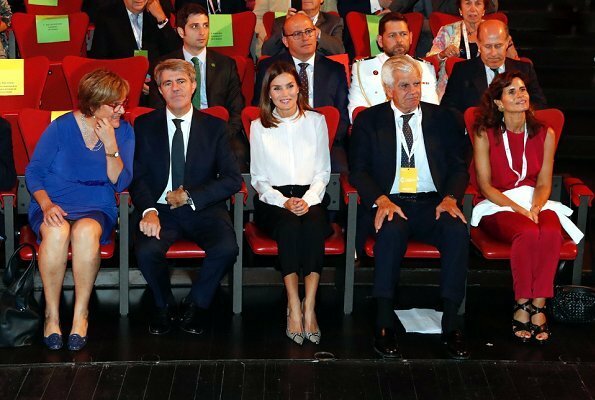 It is a little stuffy for Letizia.